"What is that weird-looking bird at your birdfeeder?" my mom asked me, pointing out the window. 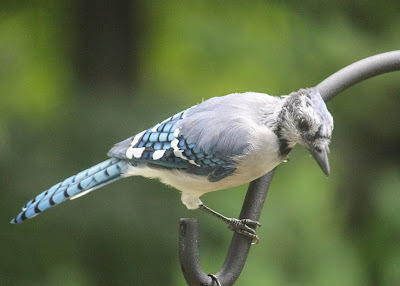 "I think it's a Blue Jay," I puzzled. "Well if that's a Blue Jay," she replied, "then I think it's sick." 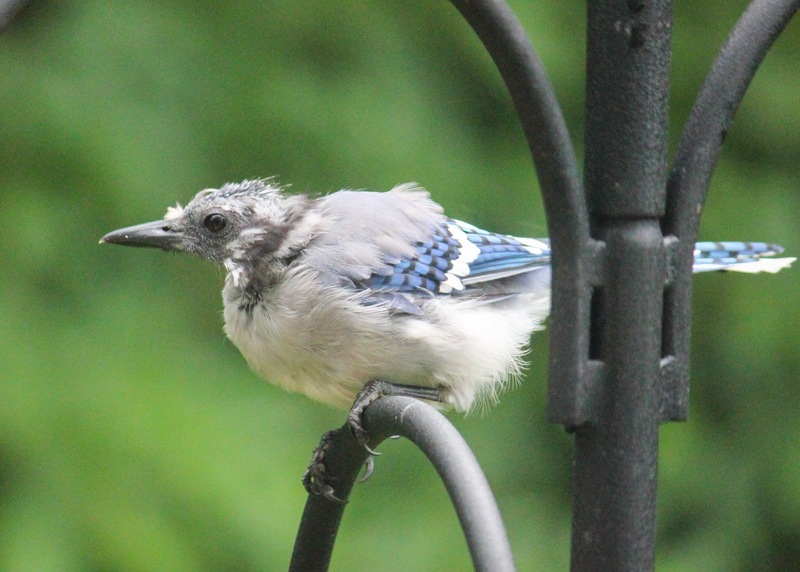 Indeed, there were at least a couple of Blue Jays in my garden that were having some really, really bad hair days. But after some quick research online, I found out that the bald look is a somewhat natural, though still unusual fashion for Blue Jays this time of year. 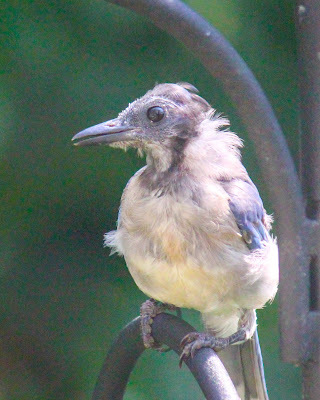 Birds generally molt twice a year, and while most birds go through their molting slowly (and more gracefully), sometimes there are a few extra special individuals that molt all of their head feathers all at once. These birds tend to be Jays or Cardinals, though there are sometimes other birds that will do this. 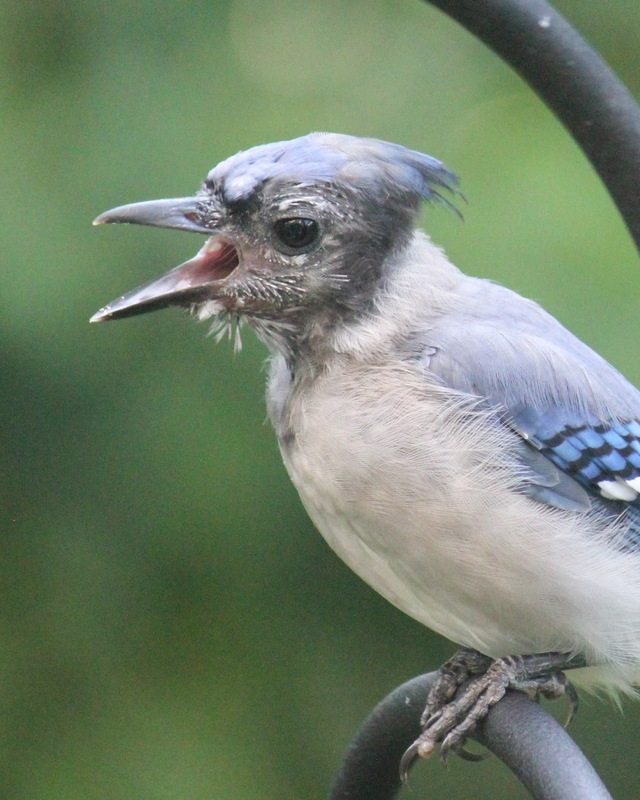 Scientists vary on their reasons why certain Blue Jays molt all of their head feathers at once. Some say it's just particular to that individual bird, while others say that it is due to mites or due to stressors in their environment. Thankfully there is nothing to worry about. I was relieved to find that no matter the reason, the feathers will quickly grow back in. I'm sure the Blue Jays are relieved by that, too! Oh bless! Their colours are still amazing despite the sudden moult. They really are such beautiful birds (normally). It is too bad that their song is rather harsh and they have a reputation of being kind of a bully at a birdfeeder, otherwise people would love them more. Ha, you really could see it in a horror movie, couldn't you?! Good to know that they're okay and their haircuts are only temporary! By now all their head feathers have already grown in, thankfully! When we had chickens we found the same thing. Some birds would lose just about every feather they had at one time and others would loose some for what seemed like forever. Fortunately it's temporary, because they sure don't look pretty. Oh yes, that happens to birds here, too. 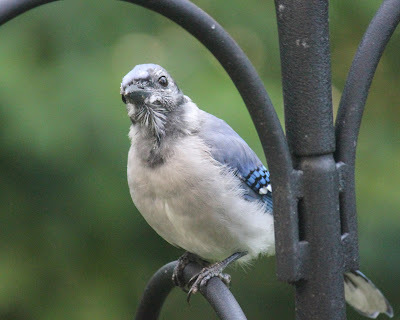 I've noticed it mostly with Cardinals and House Finches, but I think I've seen some Jays like yours, too. They do look sort of pitiful for awhile before their feathers fill in. Tee hee. I'd never seen it before now. Thankfully my cardinals and house finches still look nice and fluffy as opposed to scary! 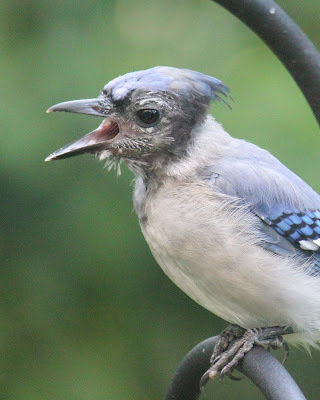 Is there a Rogaine for Bluejays? They definitely look like they need it! I had never heard of this either until I saw my poor bald bird. My goldfinches sometimes look pretty funny too when they molt into their summer and winter coats, but at least they don't usually go bald. Poor guys! I've never seen balding bluejays before, but then maybe the ones around here are too embarrassed and hide away:) Glad to know it's only temporary. Ha, I do wonder if they get a little chilly on the top of their head, too. New reader here - was directed here from google when I found little white eggs on stalks in my dill. Thank you for the post on green lacewings. I had never seen their eggs before! Now I'm enjoying all your posts. I'm in California, so while there are differences, we share a few garden commonalities. Love your nature focus. Thank you! Glad it helped you figure out the lacewing eggs and that you are enjoying the blog, Elizabeth! Glad to 'meet' a fellow nature lover!